Looking for an easy way to catapult your ranking in Google without expensive Adwords campaigns? Ever thought of Google My Business and Google Posts? Google My Business can significantly increase your company's visibility and let you reach more customers and prospects. In addition to general information about your business, the Google Post feature allows you to publish snack-sized content that can promote anything from company news, events and campaigns to your latest blog post. 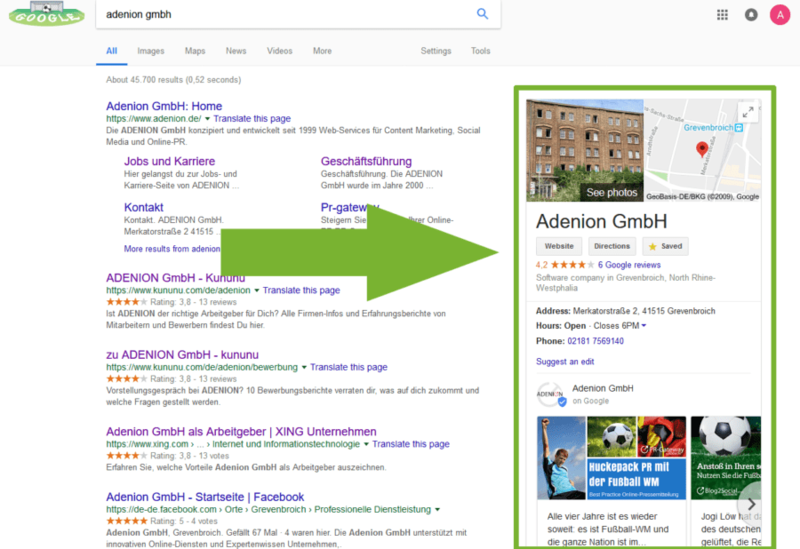 Provided that your Google My Business listing is relevant, complete and up to date, it will be displayed directly in the Knowledge Panel of the first page of the Google search results. 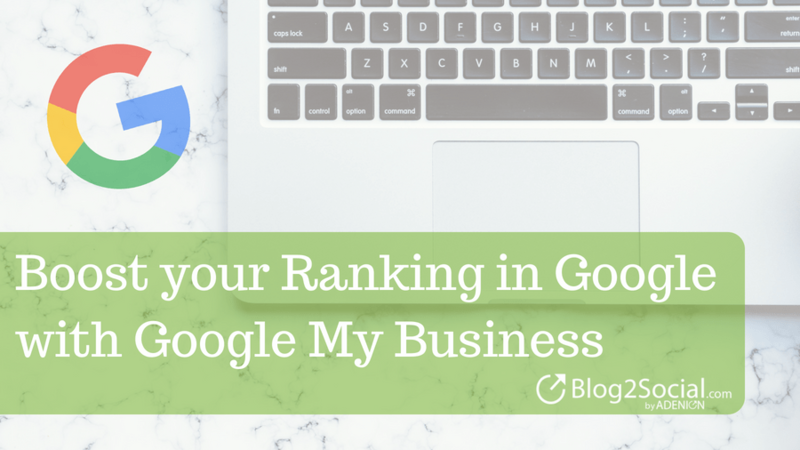 Learn how to optimize your your Google My Business listing with updates of your latest blog posts - automatically. Have you ever googled a company, a restaurant, a doctor or a hairdresser? Then you may have come across their Google My Business listing. If a company has a business listing on Google, it will appear on the right side next to the top search results. When searching for a company with a mobile phone, the business listing is displayed even more prominently at the top position on Google. 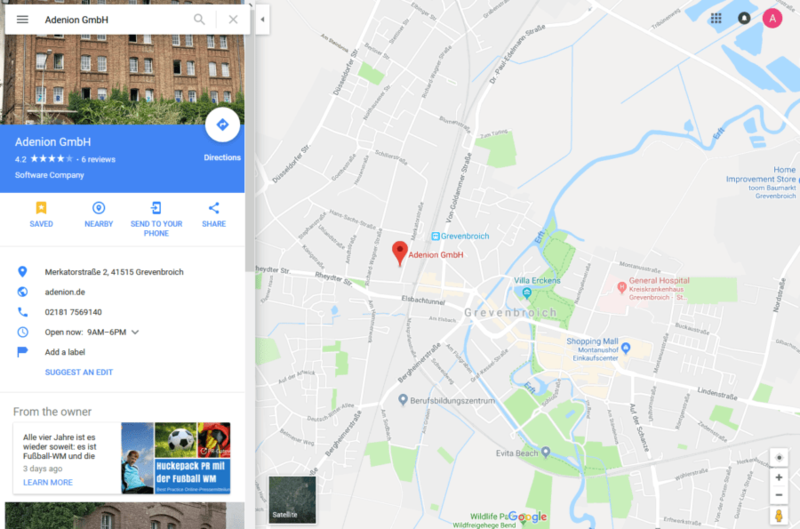 A Google My Business listing is not only visible in the top search results, but also in Google Maps. Tip: Don't miss out on this top featured position on Google for your company - without even spending a dime. Google My Business is free of charge by Google. Learn how to make the most of your Google My Business listing. You can create and maintain your own Google listing for your company or service to improve your presence in the Google search results and the Google services Google Maps and Google+. Any business, shop or office with a valid business address can claim or create a business listing on Google. At http://business.google.com/ you can create or edit a business listing for your company. Google assigns your business listing to your address using Google Maps and displays your company's listing more prominently for users from your area. Google My Business allows you to publish company news and event announcements directly in your Google listing. This gives you the opportunity to decide which content you want to show users who are searching for your business on Google before they even access your website. For many companies, Google creates a listing automatically. As an owner, you can claim a Google listing and sign in to Google My Business to edit it. If Google has not already created a business listing for your company, you can create a listing yourself. Before you can manage your business information on Google Maps, Google Search, and other Google products, you have to verify your business listing first. Your Google My Business listing is your digital business card and can be a primary touchpoint when clients and prospects search for your company. As soon as someone searches for your company on Google, your business listing appears at the top right-hand side of the search results and is the focus of attention. However, a verified Google My Business listing does not guarantee that it will appear in the Knowledge Panel. Relevance, distance, and the prominence of the business all contribute to its standing in local search results. Therefore, a Google My Business listing should always be complete and up to date. Exciting news and interesting content presented directly in your business listing are a great way to catch your customers’ and prospects’ attention, even before they visit your website. 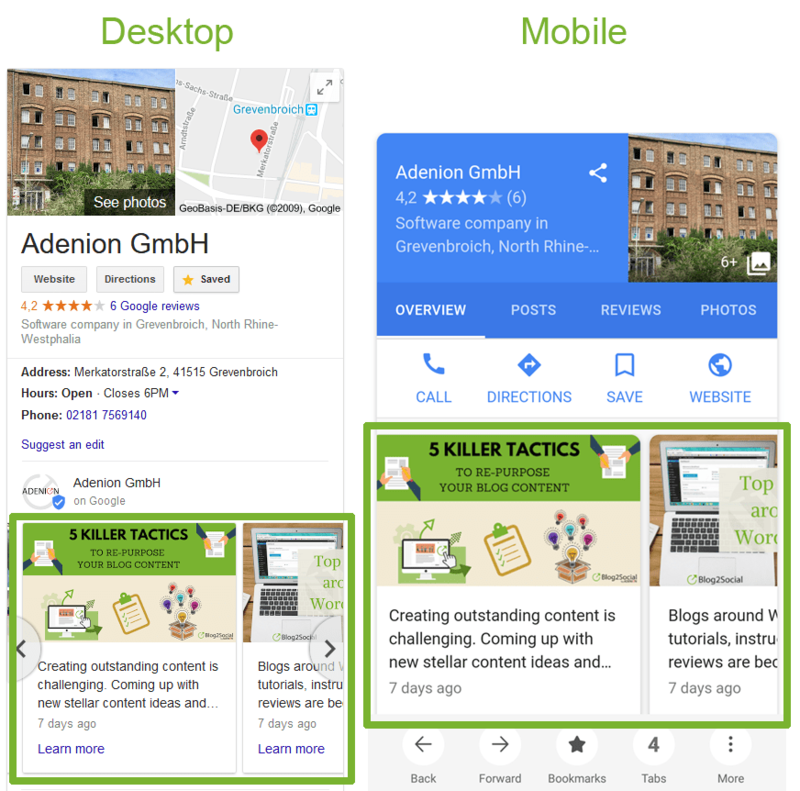 Google My Business posts are also visible in your Google Maps listing, which creates another touchpoint. Content posts on Google My Business are meant to show your latest news and articles. Your current posts will be displayed directly in your business listing. This way you can keep your business listing up to date with new interesting content. Regular content updates will keep your Google listing interesting and drive traffic to your corporate blog. Company news, press releases, blog posts or announcements are great content for Google My Business. Don't underestimate the importance of Google My Business for your content marketing and your Google ranking. Current posts on your Google business listing can reach a large number of new readers. With current posts and updates about your company, you stand out from the crowd and draw more attention to special events or campaigns and increase the visibility of your company significantly. Google My Business posts are meant for up-to-date content, as posts only stay in the overview of your business listing for 7 days. Posts on Google My Business may contain a link that leads directly to your website, online store, corporate blog, event page or a special landing page. This will take interested readers directly to the point-of-sale and help you to generate new leads. You can access your statistics in your Google My Business dashboard in the "posts" section. The statistics below each post show how many readers clicked on your Google My Business posts and how many link clicks have been achieved, thus expressing the success of your content. The statistics show the success of your posts. To connect your Google My Business listing to Blog2Social, go to “Blog2Social -> Networks” and scroll down to “Google My Business”. Click on “+Profile” on the right side to open a new window. Choose the Google account that is linked to your Google Business listing. Choosing your Google account will take you to the access confirmation page. 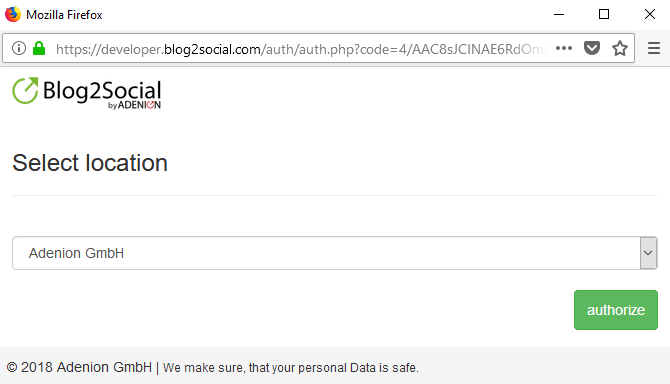 Please make sure to click “allow” to grant Blog2Social the rights to publish on your Google listing. Afterward, select the location you want to publish your blog posts on. Please note that you need to have at least one verified location in Google My Business. 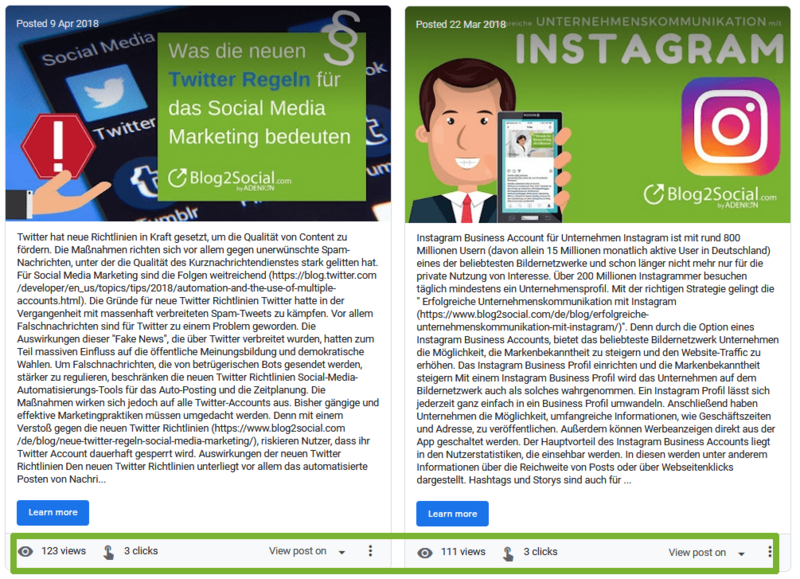 After you’ve successfully connected your Google My Business listing to Blog2Social, you can find the location listed in Blog2Social -> Networks. You can now share your blog posts on Google My Business. This >> FAQ shows you how to share individually tailored blog posts. Your articles will appear as posts on the main page of your business listing on Google and link to your full blog post or landing page. This allows you to keep your business listing on Google up to date without additional work or time. 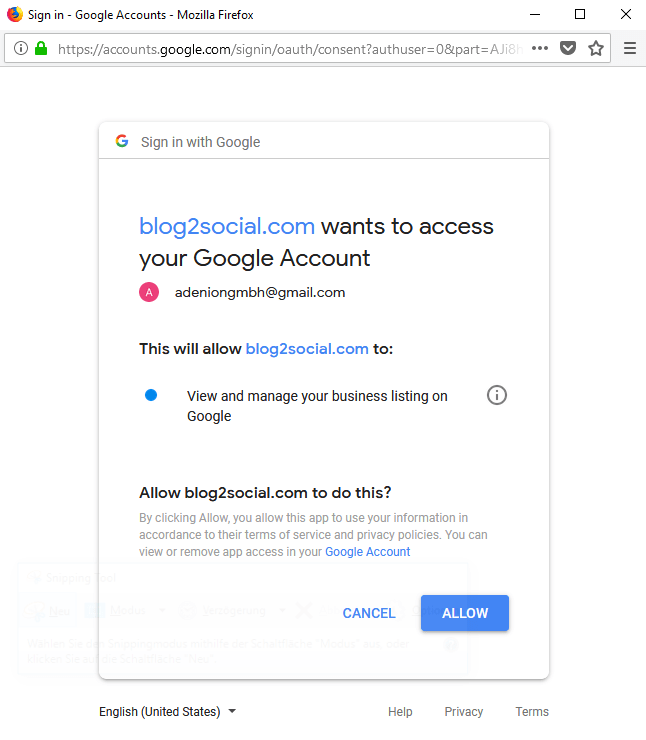 Blog2Social uses the official Google My Business API, with secure oAuth authentication to ensure your Google account is safe, to send your content to your business listing. 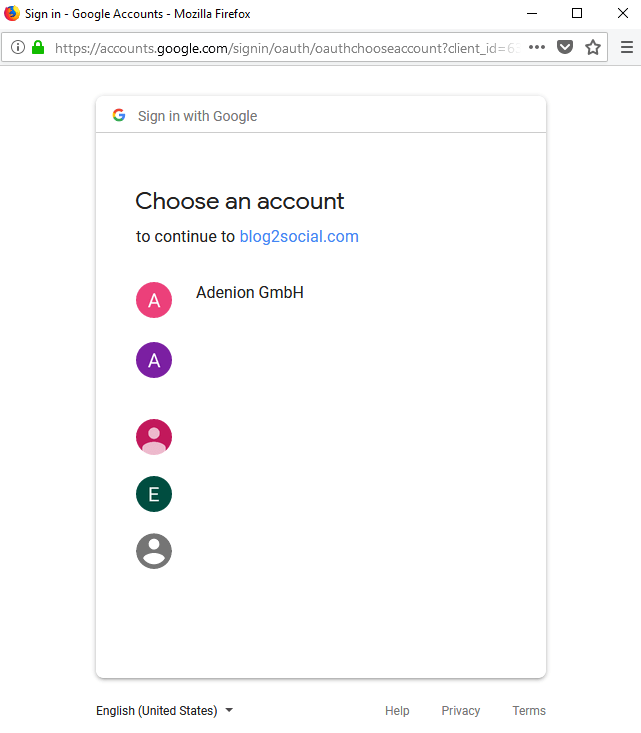 You can connect Google My Business accounts with up to nine different locations to Blog2Social and choose which location you want to share your content on. Google currently allows access to the API for all companies with up to 9 locations connected to their Google My Business account. However, Google plans to extent the API access in the future for companies with more connected locations. Optimizing your Google My Business listing with updates of your latest news and posts will help you boost your visibility in Google. Make sure to keep your business listing interesting and refresh your Google posts with up-to-date content at least every 7 days to maximize your company’s reach. Share your company news, press releases, blog posts or announcements in Google My Business to repurpose your existing content for your Google business listing. Blog2Social helps you automate the updating of your Google My Business listing with your current blog posts and news, saving valuable time and resources. Update your company pages on XING and LinkedIn in the same step to save even more time!